We have carved a niche as a trusted name, actively engaged in manufacturing, exporting and supplying of Milk Pump from Uttar Pradesh, India. These pumps are rigid and assembled under the supervisory guidance so that quality remains for longer time period. 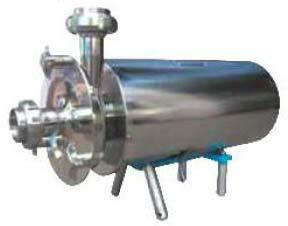 Approach us, for availing Milk Pumps in bulk, at fair prices. Description : Sanitary (hygienic ) centrifugal pump also called milk pump, CIP pump, food pump, which is one type of centrifugal pump which mainly used for pharmaceutical, food industry, dairy industry, winery, turnkey project. The pumps are made of Stainless steel 316L or SS 304, which with a surface polished, can be used to the above industry for sanitary purpose.